This month couldn’t get any better for FlexiLoans, first we got certified by the GPTW (Great Place To Work) Institution and now we’re nominated among 20 other Fintech start-ups for the India Fintech Awards (IFTA) 2018. 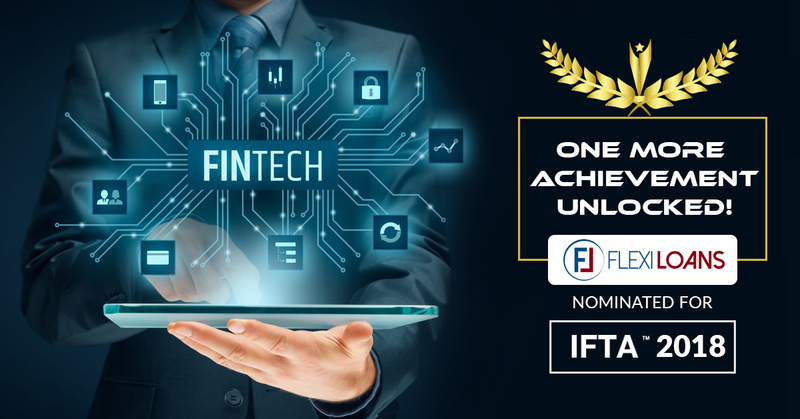 IFTA provides a platform for Fintech companies to showcase their disruptive products, give a sales pitch and network with investors, bankers, entrepreneurs, media and corporate leaders. Consider this the Oscars of the Fintech world! IFTA is the most coveted and prestigious demo event of the year for Fintech companies. Organized by the India FinTech Forum this event recognizes some of the best innovations in the Fintech space. This year-round the winner who’ll be awarded the ‘Fintech Startup of The Year’ will get a chance to showcase their product at the largest Fintech event in San Francisco – LendIt Fintech 2019. After going through a diligent and stringent evaluation by the event’s strategic partner MEDICI, 20 Fintech companies have been narrowed down to showcase their products at IFTA 2018. We are exhilarated to be a part of the eligible 20 which includes not only Indian based Fintech start-ups but also some from the U.S., the U.K., Russia, Israel, and Switzerland. Some of these Fintech start-ups are disrupting the lending industry, some are disrupting the payments industry and some are even disrupting the investment industry. To get a comprehensive list of this eligible 20 Click here. Come to say hello to Us. Book your tickets now to see Eligible 20 live on 30th November 2018 at BSE! Don’t worry if you can’t be a part of the event, watch out for updates on CNBC TV 18 the digital partner for IFTA awards. Other than that, the event has some amazing high-quality sponsors & partners. Watch out for Perfios, Government of Maharashtra, EY, BSE, Medici, CashRich, RBS, SP Jain, FlexSalary, Zone Startups, Instamojo, and many more. Also get to meet the who’s who’s in Fintech from Yashish Dahiya CEO & Co-Founder PolicyBazaar, Sundeep Sikka ED & CEO Reliance Nippon Life Asset Management Ltd, Vinod Keni Partner Artha Venture Fund, Sujatha Mohan Head – Digital and New Initiatives RBL Bank and many other familiar & prominent faces from this space. 04:30 PM – 05:00 PM FUTURE OF FINANCIAL SERVICES: FINTECH OR TECHFIN?